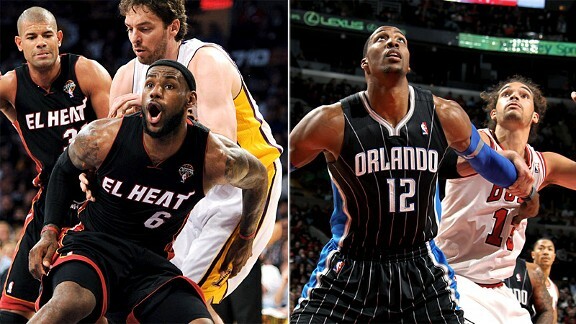 LeBron might be a frontrunner for MVP, but he's also a frontrunner to steal Dwight Howard's DPOY. ORLANDO – Even in election years, the Miami Heat typically don't make a habit of campaigning for their players when it comes to consideration for individual NBA awards. So it's a good thing LeBron James' candidacy speaks so profoundly for itself these days. The fact LeBron is likely a frontrunner for his third Most Valuable Player award in the midst of the most efficient season a player has had in NBA history is a no-brainer. But it's the legitimate case he's making for another of the league's highest honors that's a bit mind-boggling. Maybe next season, Serge Ibaka. Why? Because LeBron should be on his way to defensive player of the year accolades this season, too. Perhaps no stretch of play can underscore LeBron's value on the defensive side of the ball more than his potential assignments over these next two games. On Tuesday in Orlando, LeBron is almost certain to spend a few possessions trying to slow Howard, the league's most dominant center. Not only did LeBron survive the last time he drew that assignment, he held his own in Miami's home victory in February. And LeBron's encore Wednesday night will likely be a late-game stare down with reigning MVP Derrick Rose. Allow that to sink in for a minute. In a span of two games on consecutive nights on the road, LeBron, a 6-8 small forward by definition, will likely be asked to defend the NBA's best big man as well as arguably its top point guard. It's a dynamic task. But LeBron has made ordinary work out of extraordinary assignments like this all season as the Heat's de facto point guard and emergency center. Stretching one's versatility in such extreme roles would garner an Oscar if this were the Academy Awards. And in basketball, it should get you the rare double take of end-of-season hardware. Only two players in league history have won MVP and defensive player of the year awards in the same season. Hakeem Olajuwon was the last to do it following the 1993-94 season. Michael Jordan was first during the 1987-88 season. Discussing his own standing among potential candidates is an uncomfortable conversation for LeBron. He'd almost rather talk about things he'd do differently in handling his decision to leave Cleveland for Miami as a free agent in 2010. So when asked if he believes he should be considered for defensive player of the year, LeBron quickly steered the discussion up the Florida Turnpike toward Howard, who has won it three consecutive seasons. That's no shot at the Magic. Instead, LeBron was simply going above and beyond to praise the defensive dominance of their franchise centerpiece – a player who is also involved in extensive trade speculation and could be facing the Heat in Orlando for the final time amid Thursday's deadline. While LeBron won't match Howard's rebounding or Ibaka's shot-blocking totals for Oklahoma City, neither of those players – nor anyone else in the league – can pull off what the Heat's catalyst has done on a routine basis this season. LeBron has defended everyone from Camby to Collison, from Pau to Chris Paul. This week, he's headed from Dwight directly to D-Rose. It's part necessity because the Heat are short on reliable depth at the center position, which is something team president Pat Riley is contemplating how to address. But it's also all desire on LeBron's part. He came relatively close to winning the top offensive and defensive awards with the Cavaliers in 2009, when he won his first of consecutive MVPs and finished second to Howard for defensive player of the year. During that season, James had 137 steals, 93 blocks and stole four first-place votes from Howard on the way to being named to the NBA's All-Defense first team. But not even in that season was LeBron required to play anywhere at any given time on such a regular basis as this season. Heat coach Erik Spoelstra said he spent significant time meeting privately with LeBron last season about embracing the burden he would have to carry in Miami defensively. This season, the communication is less verbal, and sometimes all it takes is a nod between the two. Spoelstra then paused briefly for impact. And this point also is where LeBron allows his performance to do the pontificating. He has friends lobbying on his behalf. Heat guard Dwyane Wade told the Associated Press last week that he hopes to see LeBron pick up both awards. Wade wants to attend both press conferences for historical value. Jordan left somewhat of a blueprint, and James isn't too far off the path statistically. During that 1987-88 season, Jordan shot 53.5 percent and averaged 35 points, 5.9 assists, 5.5 rebounds, 3.1 steals and 1.6 blocks. By comparison, LeBron's field goal percentage (55.2), rebounds (8.4) and assists (6.6) are higher this season, although his scoring (27.7), steals (1.8) and blocks (0.8) are lower. Overall, it's on par. But LeBron knows it's not all a numbers game. So does accurate and honest perspective. Since 1995, only two perimeter players have won defensive player of the year: Ron Artest (2004) and Gary Payton (1996). For LeBron to receive strong consideration, it'll require an appreciation for his work against point guards as well as his ability to bang in the paint. Of the two chores, LeBron said it's more difficult to defend quick guards because he must fight through screens. But battling in the post isn't exactly a consolation. If this keeps up, voters should do whatever it takes to acknowledge LeBron's two-way, on-court stump speech.